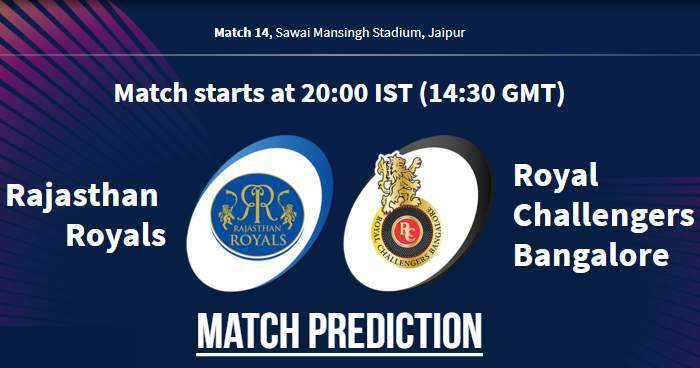 Home / IPL / IPL 12 / IPL 2019 / Jaipur / Match Prediction / Rajasthan Royals / RCB / Royal Challengers Bangalore / RR / Sawai Mansingh Stadium / VIVO IPL 2019 Match 14 RR vs RCB Match Prediction, Probable Playing XI: Who Will Win? VIVO IPL 2019 Match 14 RR vs RCB Match Prediction, Probable Playing XI: Who Will Win? Probable Playing XI for RR: Ajinkya Rahane (c), Jos Buttler (wk), Sanju Samson, Steven Smith/Ashton Turner, Ben Stokes, Rahul Tripathi, Krishnappa Gowtham, Jofra Archer, Dhawal Kulkarni/Jaydev Unadkat, Varun Aron, Shreyas Gopal. Probable Playing XI for RCB: Virat Kohli (c), Parthiv Patel (wk), Moeen Ali, AB de Villiers, Shimron Hetmyer, Shivam Dube, Colin de Grandhomme/Tim Southee/Nathan Coulter-Nile, Prayas Barman, Yuzvendra Chahal, Umesh Yadav, Mohammed Siraj/Washington Sundar. The team batting first has won 5 of the last 8 IPL matches played at the Sawai Mansingh Stadium in Jaipur. So the team winning toss would like to bat first here. Just a quick trivia, Rajasthan Royals captain Ajinkya Rahane has won all three tosses this season. Our Prediction for IPL 2019 Match 14 RR vs RCB Who Will Win? The key for RR will be Jofra Archer. He can be extremely effective at death. He's got an extra 10ks compared to every other fast bowler and that'll make things tough at the death for the RCB. But Jofra Archer has an Economy Rate of 6.33 in the first three games while the rest of RR pacers cumulatively concede at 11.26 per over. While being run out in a controversial manner against Kings XI Punjab, Jos Buttler has been dismissed for scores of 5 & 6. On the other hand, Royal Challengers Bangalore have won just 9 of their 31 matches in the last three seasons. For such a popular side – led by the Indian captain, those are extremely poor returns. Virat Kohli’s batting average of 21.27 against the Rajasthan Royals – his lowest batting average against all IPL teams. He has scored only 2 half-centuries in 17 innings against RR. In six innings in Jaipur, Kohli hasn't crossed 40 and has a Strike Rate of 94.74. In our prediction, Rajasthan Royals are likely to win this match at Jaipur.